Which industries in Georgia are adding jobs? Which are Georgia’s winning and losing industries since 2000? Which are Georgia’s winning and losing job industries since 2000? When he visited Boeing’s plant in South Carolina, President Trump called it a celebration of American manufacturing, and said jobs would soon come back to the U.S. So we asked the question: how has U.S. policy, especially trade policy, affected jobs in Georgia over the last two decades or so? To be sure, it is difficult to point to one policy or agreement (like NAFTA) as the cause for changes in a certain industry. Yet, it is worthwhile investigating how Georgia’s major industries have fared since the turn of the century. 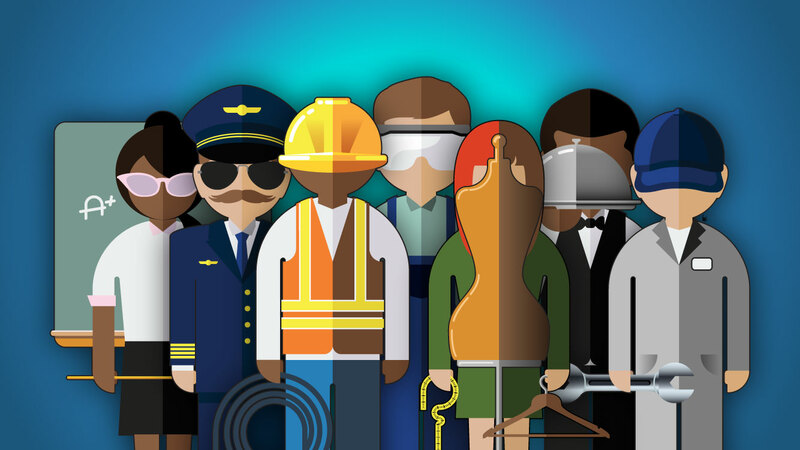 Data on average monthly employment and weekly wages in various industries, maintained by the Georgia Department of Labor, provides good insight into how workers have fared in these sectors. Overall manufacturing: It’s evident that manufacturing is no longer what it used to be. While NAFTA and trade deals tend to get the blame for job loss, economists believe automation and technological innovation play a more significant role. “From the early ’80s, there has been a lot of introduction of computers and robots. All of that has functioned as a substitute for workers who used to work on the assembly line,” said Tibor Besedes, associate professor of economics at Georgia Tech. He added that manufacturing is now much more skill-intensive and requires a better-educated workforce to operate the new machinery. Manufacturing jobs saw an uptick, though, just after the 2008 recession. But free trade also meant manufacturers had access to plentiful, cheaper labor abroad. This is reflected in the weekly wages, which have seen only an 11 percent increase in the last 15 years. “If you look at inflation-adjusted real compensation of industry workers for blue-collar manufacturing... it doubled from 1950 to 1980. Between 1980 and today, it’s basically stuck. Remember this was a period when manufacturing productivity grew significantly and, yet, pay didn’t grow a lot,” said Jared Bernstein, a senior fellow at the Center on Budget and Policy Priorities and a former adviser to then-Vice President Joe Biden. Apparel: The apparel manufacturing industry (includes cut and sew, and manufacture of garments in establishments) has been hit hard. Since 2000, this sector has seen an 85 percent drop in employment. Wages in the apparel industry have only marginally increased. A lot of these jobs have moved to countries with lower wages and plentiful labor, said Jeff Rosensweig, an associate professor at Emory University who specializes in global economics. Textiles: Textiles, too, have been struggling. This sector, which includes mills that produce yarn as well as those that produce textile products like sheets and towels, employed 97,863 workers in 2000. It now employs less than half that number. As with apparel, real wages are nearly stagnant, having seen a paltry 3 percent hike. It’s not all grim news, though. Some manufacturing sectors have performed well in recent years. Take the transportation equipment industry, for instance. Transportation equipment: This includes manufacturers of airplane and auto parts. Since 2009, this sector has added more than 16,000 jobs. A large share of the credit goes to the airplane parts manufacturing industry, which constitutes 16 percent of Georgia’s exports, according to census data. Wages in transportation equipment have increased by 14 percent. Electrical equipment: Factories that manufacture electrical equipment, components and appliances saw a rapid decline until 2010. But since then, they have added more than 1,600 jobs. Pay in this industry has steadily increased. Adjusted for inflation, weekly pay for workers is up 37 percent since the year 2000. Education services: But the real winning story is in Georgia’s service sectors. According to Rosensweig, Georgia, and Atlanta in particular, has focused on attracting foreign tourists and students. This focus seems to be reflected in employment as well. The education services sector, which includes teachers and administrators at schools and colleges, has been adding jobs at a steady rate in the last 15 years. From 36,000-odd employees in 2000, it now employs more than 67,000 people. On the other hand, real wages have not followed the same trend. After an initial increase at the start of the century, weekly pay has seen only a marginal rise — up $26 from 2006. Accommodation and food services: This sector (including hotels, restaurants and bars) has added more than 100,000 employees since we entered the millennium. Except for the crash during the recession, the job growth rate has been quite healthy. Real wages, however, have remained flat, with a slight decrease (from $342 in 2000 to $325 in 2015) indicating that raises have not kept up with inflation. Notes: Weekly wages have been adjusted for inflation with 2013 as the reference year. Employment data maintained by the Georgia Department of Labor comes from the Quarterly Census of Employment and Wages (QCEW). Industries are classified according to the North American Industry Classification System (NAICS). You can read more about the data in detail here.